It was always tough to get a reservation at Gaggan, an inventive Indian restaurant in Bangkok. Now, after the restaurant’s third straight win in the closely watched Asia’s 50 Best awards, the wait can easily stretch to four months. A four-person team has been hired just to manage the roughly 500 booking requests that come in every day. And a Michelin star could be just over the horizon. But Chef Gaggan Anand’s response? Shut it down. “Every restaurant has a 10-year life,” he said. “After that, it becomes a brand.” The plan to close his eponymous Gaggan in 2020 is highly unusual at a time when celebrity chefs are more likely to go in the direction of Gordon Ramsay and Wolfgang Puck and try to spin their success into global food empires. Not only that, it is also a safe bet Gaggan will land a spot in the first Michelin Guide for Bangkok due in December. Using molecular gastronomy tools such as liquid nitrogen, Anand has redefined what traditional Indian food looks like while preserving authentic flavours and tastes. Still, he believes in an expiration date. He compared himself to a Champagne bottle that, once opened, would eventually fizz out. He is taking a cue from his mentors at the award-winning El Bulli, which closed in 2011 when it was still immensely popular and charging 250 per meal. The Spanish restaurant had won the overall World’s 50 Best awards five times and was a prime example of the star-making power of the list. The ranking began as a publicity stunt and has grown into an event akin to the Oscars of the food world. 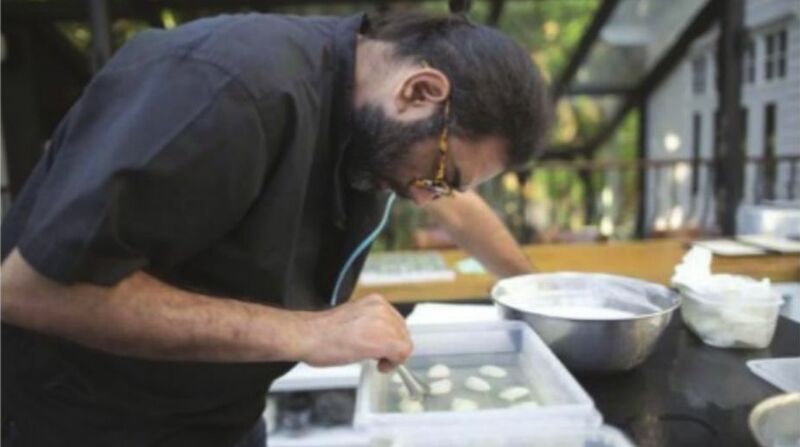 Gaggan came in at number 7 on this year’s global list. Anand, 39, was born in Kolkata and cooked his first dish at age seven: a packet of instant noodles. He recalls crying in frustration because the finished product looked nothing like the artistically garnished photo on the packet. His plating skills have vastly improved since then. He interned at El Bulli in 2010 before opening his eponymous restaurant in December that year. It was at the Spanish restaurant that he learned to experiment with food. These days, he spends the majority of his time in his research and development lab. One of his most complex dishes is a coin-sized eggplant cookie. Fresh eggplant is charred, skinned, cooled, freeze-dried, ground and moulded into a powdered compress with curry oil and Indian spices. He then sandwiches two together with a layer of onion chutney jam between them. The whole process takes four days. Diners are handed a 25-course tasting menu with zero words – just emoji. The menu is a way to transcend language barriers, he said. (Once all the courses have been served and the meal is complete, diners get a menu with words to let them know what they have just consumed.) In true Indian fashion, 23 of the dishes are eaten by hand. Even on nights when he is not in the restaurant, Anand runs a tight ship. He trawls social media and sends screenshots of unsatisfactorily prepared dishes to his chefs with feedback and criticism. “Whichever part of the world I’m in, I can actually see how my food is and whether people are liking it,” he said. He is certainly focusing on Asia. Next, he wants to move to Japan and open several new restaurants, drawing on Buddhist principles to challenge himself to avoid boredom and burnout. With partner Takeshi Fukuyama of La Maison de La Nature Goh, Anand plans to open a tiny restaurant – called GohGan – that will be open for just 20 days a month. He wants to keep prices down to 15,000 yen per person. That would bring in only a quarter of Gaggan’s revenue. For cash flow, he will rely on investments in other restaurants in Bangkok. These include Suhring, which serves up modern German cuisine; Gaa, a EuropeanAsian fusion restaurant that uses all-local produce; and his own steakhouse, Meatlicious, which is just down the street from Gaggan in the Thai capital. Over the next few years, he also expects to open two additional restaurants: Raa and Sol. Raa will be a Japanese-Indian izakaya, or gastropub. And in 2019, Sol, a bakery and dessert restaurant led by Gaggan’s longtime pastry chef Solanki Roy, will be built. Coming full circle from the first dish he ever cooked, he still loves indulging in noodles, his favourite food. But you won’t find them on his menu. He isn’t confident about his own noodle-cooking skills just yet. The one thing you’ll never see him eat or cook in his restaurant? Broccoli. Much like his one-year-old daughter, he just hates how it tastes.